The variety of words found in poetry makes studying it on a regular basis a great way to increase vocabulary in an entertaining way. For several years I followed the Ambleside On-line poetry schedule. The poems of about four poets per year are posted or linked on the website. Each day we read a new poem plus reviewed a few we had read previous days. For my oldest who can easily comprehend anything, this method worked well. Poems I couldn't understand she could even interpret for me. Unfortunately, my son does not comprehend poetry quite so easily. Therefore, the selected poems from Ambleside On-line were far too difficult for him. After several attempts to follow the same method, I abandoned it and switched to reading poetry from books aimed at much younger children. The Llama Who Had No Pajama: 100 Favorite Poems and The Fat-Cats at Sea were two of our favorites from last year. With my youngest we read many Mother Goose poems following the same method. This year I will introduce new poetry books to the kids and see if they are interested in keeping a poetry notebook where they can copy down their favorites. 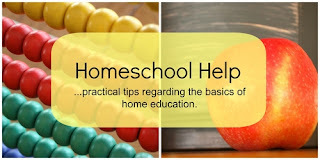 Since this post is part of the Homeschool Help series I plan to read the poetry posts of the other bloggers for more ideas. I hope you will join me. Gosh, it sounds like your eldest daughter really gets poetry! I just looked up The Llama Who Had No Pajama book after seeing it on Chareen's site. I thought it looked great but everyone said they'd bought it for their four year olds so I wasn't sure. I might go back and get it now. It was a fun book - a lot like Mother Goose. My 10 year old liked it. Thank you for sharing the Ambleside website! Lots of info!! My kiddos really enjoy the silly side of poetry. They adore Shel Silverstein and Jack Prelutsky.